Password Policy Management Consistently strong passwords. Reliably powerful security. With your users’ passwords acting as the key to unlock access to all of your applications and data, your organization’s data security is only as strong as the weakest password of your users. Akku’s password policy solution helps to ensure that all of your users consistently comply with a high standard of security while setting their passwords, without the need for a separate password policy enforcement tool. 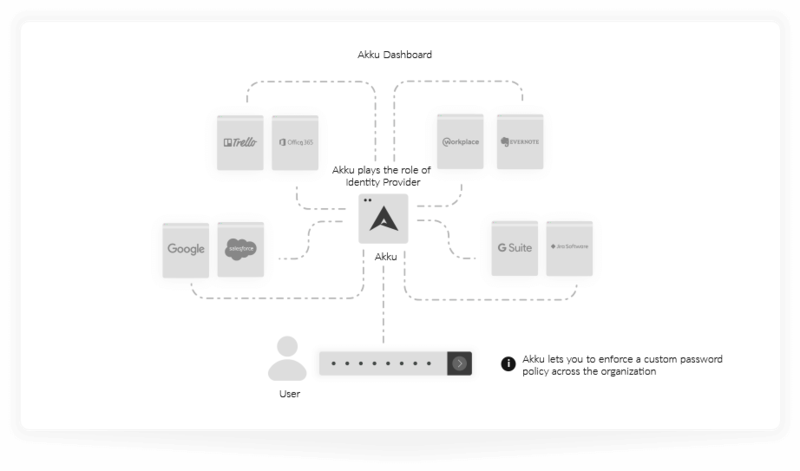 Your administrators can set up a customized password policy for all users on Akku in compliance with your organization’s security standards. They can establish rules regarding passwords’ length, complexity, and the frequency with which they must be changed. These rules help users set up passwords that are strong enough to effectively protect your information and apps. Administrators can also choose where to enforce each policy - either as a blanket rule across the entire organization, or applied only to specific users, depending on the sensitivity of the data and frequency of access, among other factors. Akku makes password policy enforcement customizable to the very last detail. By establishing and enforcing a strong password policy, Akku enables your organization to meet compliance requirements - in fact, the default password policy from Akku complies with the password policy requirements of industry standards. So protect your data more effectively and focus on productivity without worrying about compromised security due to poor user password selection.